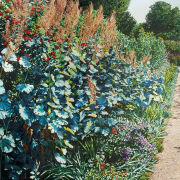 Karl Maughan is known for his vibrant, celebratory paintings of gardens that explore the artist’s love of colour. In 1986 Maughan graduated with BFA from Elam School of Fine Arts, University of Auckland. Following this he left New Zealand for London where he lived for 10 years. Charles Saatchi became an early collector of his work, and Maughan’s paintings were subsequently included in a number of Saatchi Gallery exhibitions, including Neurotic Realism in 1998 and I Am A Camera in 2001. This work, Plume, was one of three significant works by Maughan that hung in Saatchi’s home. Saatchi regularly turns over his art large collection, and Maughan seized the opportunity to buy this key work back. This Limited Edition of Plume is currently available from the gallery.